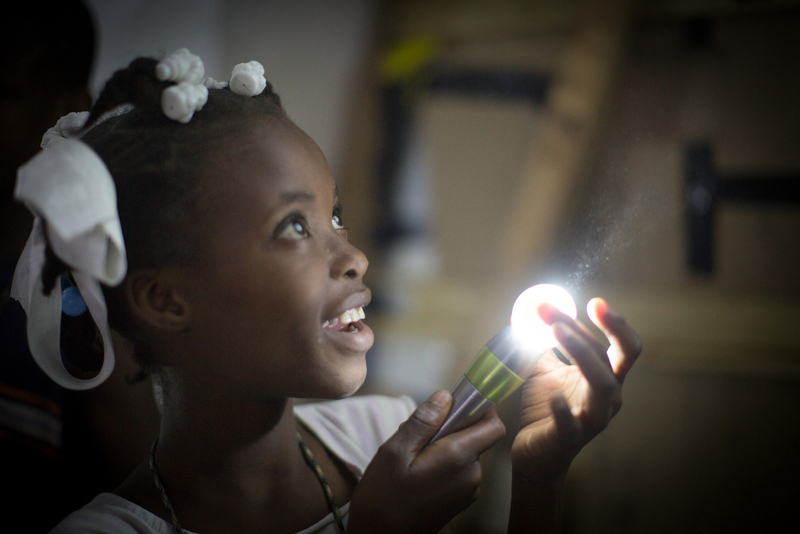 A guided inquiry into light, shadow and optics, designed with the intention of activating a community center as a place of learning and curiosity for children in Komye, Haiti. A collaboration between Guilds and Konbit Shelter. After the 2010 earthquake, artist Caledonia Curry (also known as Swoon) and a small group of U.S. artists and builders formed a group called Konbit Shelter and began working with the village of Cormiers, located a few miles from the epicenter of the quake. Within six months Konbit had mobilized their creative community, raising funds to build new structures using the highly resilient SuperAdobe construction method and creating 70 construction jobs for residents in the process. The project resulted in three SuperAdobe structures, the centerpiece of which is a three-dome community center with 20-foot ceilings that terminate in an oculus, letting in the abundant sunlight of Haiti. In the three years since the quake, Konbit’s relationship with the village has evolved. Now that Cormiers is no longer in the immediate aftermath of structural devastation, thoughts have turned towards what would be necessary to activate the center as a place dedicated to the children of the village. To this end, Konbit will be collaborating with us, working with Cormiers families towards creating an inviting environment for play and inquiry within the domes. When we first saw pictures of the community center, with its oculus and and abundant natural light, we were taken with its potential as a place for light-based play. Guilds and Konbit will be traveling to Haiti in January 2014 to explore the luminous properties of the domes and begin a conversation with Cormiers families about their desires for the future of the community center. This fall, Guilds has been in residency at the Lower East Side Girls Club in NYC, conducting a ten-week program for children called “A Bright Dark Room”. In this workshop, teen and ‘tweenage girls explore optics, light as a substance, and the elemental building blocks of the camera. Using light, lenses, and various bright and dark rooms of the Girls Club’s beautiful new facility on Avenue D, we’ve been exploring how play with light can change our perception of the world, of ourselves and of each other. In January, we’ll pack up our lens collection and head to Haiti, where we’ll be collaborating with the people of the village of Komye and our friends at the Konbit Shelter project to illuminate the Komye domes. Guilds and Konbit will return to the Lower Eastside Girls Club at the end of January, sharing with the girls the story of how their fellow explorers in Komye interacted with the provocations of the workshop, creating a bridge between children in Komye and children in NYC. In the dark room at the Lower Eastside Girls Club. Inside our camera obscura at the Lower Eastside Girls Club. When in Cormiers, we’ll also begin a conversation with families about their desires for the future of the community center, while taking measurements and drawing up plans to add a new set of features to the domes. Working with children and adults, we will explore different ways we can embed lenses in the walls and ceiling, to create a multimodal camera obscura that demonstrates the science of light while creating opportunities to observe and delight in images of the natural world, and of each other. When we return to NYC, we’ll grind some lenses to the specifications of the domes and come back in the spring to install them, provoking a longer, in-depth exploration of the eye, the camera, and the image. Through this initial programming on light, we wish to inaugurate the domes as a space for children, and help Cormiers families move towards the creation of a resilient, community-run learning center. The collaboration between Konbit and Guilds is built around our common belief that spaces of joy and curiosity are the ether in which we become our truest selves. We are excited to participate in the creation of a space dedicated to this becoming: a space that encourages the scientific and aesthetic exploration of the world around us, of phenomena both as commonplace and as mysterious as light. Working with a signpainter, we created a handpainted announcement of our children's workshop and set it out in front of the community center. We spent our first week in Haiti tinkering with the domes, observing how they interact with the sun’s daily path, measuring all the openings and creating cardboard prototypes of optical modifications we would later fabricate with oak from a nearby forest. Our strange daily work began to draw children into proximity, piquing curiosity and filling up our registration sheet. We began the workshop on week two, with a group of 30 children, ages 3 to 15. By the end of the week, the group had swelled to 50 - new children would arrive each afternoon, some had even gone to the trouble of creating a forgery of the special nametags we had made for each enrolled child. Each child received an optics kit that included a 50mm lens, a first-surface mirror, a loupe, and a simple microscope, or "bug box". Throughout the workshop, we explore the properties of each of these object in the Haitian sunlight, and combined them to create more complex instruments. On Friday, the workshop culminated in an exposition for the village, in which children gave tours of the new installations in the domes, taught classes on optics and camera obscura-aided portraiture, and performed several one-act shadow-puppet musicals. We also used story and dance to create a forum where we could learn about each other's culture. Children created shadow puppet performances, composing their own narratives and setting them to songs they invented or chose from their collective repertoire. Guilds educator Nkoula Badila taught daily classes in Congolese folkloric dance, and her students in turn taught her Haitian dances and folk songs. Over the course of five days, our intention was to incubate a culture of holistic inquiry, one in which children might pass back and forth between scientific and aesthetic modes without distinction. As we discovered in the fall during our residency at the Lower Eastside Girls Club, the camera obscura is an object that exists squarely in between the disciplines of science and art. It offers a bridge between these disciplines, posing unavoidable optics questions in the child artist (“Why is the image upside-down?”), and drawing the child scientist into aesthetic considerations as they adjust the focal plane and composition of the image. Perhaps more importantly, it creates a space for a child to inhabit that, in being both scientific and aesthetic, is also neither - a place where a child can simply observe, exploring their own capacity for observation, and maybe expanding it a little at the same time. The camera obscura, as well as the collection of lenses and mirrors we gave each child, can be used as a tool to increase one’s powers of perception, to see details hard to observe with the naked eye, to bring faraway things up close, and make small things big. In amplifying a child's perception, we notice that this also tends to encourage the discovery of a feedback loop, in which the more attention the child gives to their observations, the more delight and wonder they receive. In our own lives, the joy we derive from this loop is a driving force behind our own practices as educators and artists. After the conclusion of the workshop, we stayed on in Komye for another 10 days, conducting exit interviews with the participating families. From the 50 workshop participants, we helped to select a group of the 21 oldest children, aged 10-14. This group consists of eleven girls and ten boys, each of whom expressed an interest in continuing to explore light in its various forms on a weekly basis. Thus was born Club Obzevatwa, which will meet in the community center each Friday after school for the duration of the Spring 2014 semester. Leading the club are four Komye women selected by the community who will facilitate club meetings and assist the children as they continue their explorations. To support the club, Guilds and Konbit Shelter have commissioned the fabrication and installation of three large camera obscura, made of oak. Designed by Guilds, they are a variant on the obscura installed at the Lower Eastside Girls Club: the lens housing is shaped to fit into the windows of the community center, so that an artist inside the domes can create a portrait of a subject sitting outside, illuminated by sunlight. 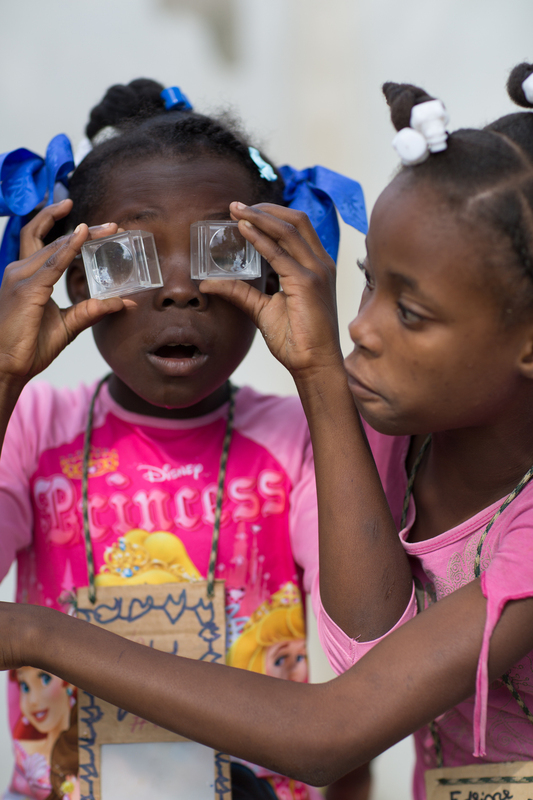 Guilds and Konbit are working with astronomer Robert Clark to design special equipment that will help Club Obzevatwa begin to explore the celestial bodies of the breathtaking Haitian night sky. Our relationship with the children and families of Komye is one of mutual admiration and enthusiasm, and is born out of a deep desire to learn about each other. We look to the children, families and teachers that make up Club Obzevatwa as collaborators in this endeavor, and with their guidance we hope to learn how we - as educators, artists and designers in the US - can have a meaningful and supportive relationship with a group of curious children in Haiti. We invite you to participate in supporting Club Obzevatwa: to learn more about giving, or to volunteer, please get in touch.